You are here: Home / Indian News / World news / Appeasement Politics at the cost of Honesty, Dr. Harsh Vardhan, please dont play with emotions! Appeasement Politics at the cost of Honesty, Dr. Harsh Vardhan, please dont play with emotions! Reviewed by PHARMALEADERS on November 7, 2014 . Appeasement Politics at the cost of Honesty, Dr. Harsh Vardhan, please dont play with emotions! Mr Health Minister, Why did you not listen to the concerns of the honest chief vigilance officer of the Medical Council of India (MCI), H K Jethi, instead of providing him protection after he complained of harassment and threats. Public perception will be changed if you continue to take such crucial calls. This is the second time you have decided to remove an anti-graft officer. Earlier, you had removed Sanjiv Chaturvedi, chief vigilance officer (CVO) at All India Institutes of Medical Sciences (AIIMS), acting upon the request of a senior party colleague. The Chief Vigilance Commission (CVC) has written to the ministry, demanding that the officer, who was investigating a dozen corruption cases at MCI and allegedly facing harassment and threats from the council’s officials, should be provided protection through Delhi Police and other assistance. It has also demanded that the ministry provide a report to the commission on the series of corruption cases that Jethi had investigated, but which had been allegedly held back by MCI president Jayshreeben Mehta. This is the second letter from the CVC to the health ministry on the removal of chief vigilance officers from institutions under its remit. Contradicting Vardhan’s statements, the CVC had also written earlier for clarifications on reasons behind removing the anti-corruption official at AIIMS. It had done so when Chaturvedi had pleaded before CVC for investigating his removal. 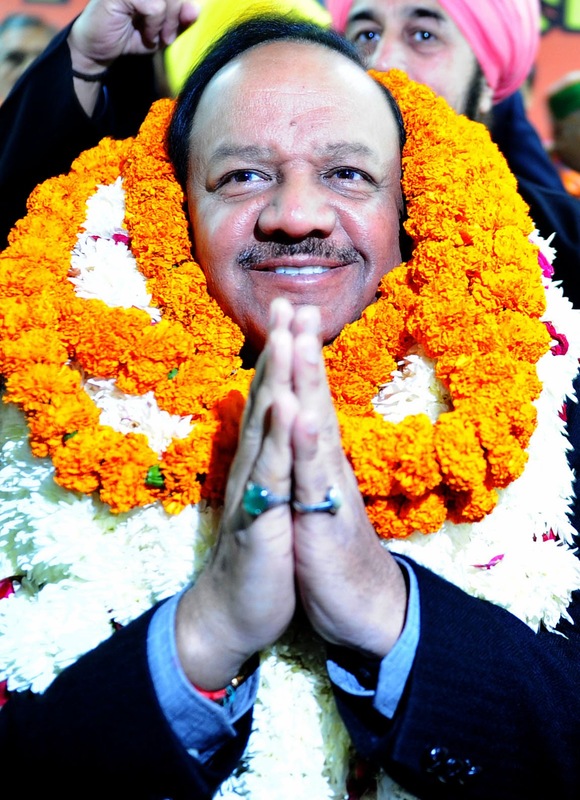 Vardhan had earlier publicly committed to cleaning up the MCI, claiming it was a “big source of corruption”. MCI is the apex body in charge of certifying and verifying the quality of medical education across hundreds of medical colleges in the country. The previous head of MCI, Ketan Desai, was removed by the United Progressive Alliance (UPA) on allegations of corruption and the Central Bureau of Investigation (CBI) probed cases against him. The government has also recently received a notice in a petition before the Supreme Court alleging that current MCI board, including Mehta, were elected through rigging by Desai. Both are doctors from Gujarat. Business Standard sent detailed queries to Vardhan, the health ministry and Mehta. While the first two did not respond even after reminders, Mehta said in her response: “The allegations made by Jethi are totally incorrect and baseless.” She accused Jethi of not acting according to the rules governing the CVO and making allegations against her when she and the MCI council asked Jethi to work according to regulations. Jethi, an Indian Ordnance Factories Service official, was appointed in October 2013 under the UPA to put an end to corruption at the MCI. However, by the end of the year, he began complaining to the ministry of “physical harassment in retaliation to his drive against corruption”. In April 2014, he alleged the MCI president was using all kinds of pressure tactics to destabilise the functioning of the vigilance division. Jethi said he “felt scared of fighting against corruption alone at MCI without any support”. He requested if nothing could be done to protect him, he be repatriated out of MCI back to his cadre to help him work without fear. With Jethi pleading for protection, the CVC also wrote to the health ministry in May 2014, just when the National Democratic Alliance (NDA) government had taken over, asking it to investigate the harassment, rein in the MCI officials and, if need be, approach Delhi Police to provide the officer protection and investigate the matter. With Jethi’s repeated pleas, the CVC’s letter and several other complaints from others of corruption continuing in MCI rising, in July 2014, the health ministry’s vigilance wing asked the CBI to carry out a “comprehensive investigation” into the mounting allegations of corruption. They noted the anti-graft officer of MCI had complained of being “forced” by Mehta to write specific missives to CBI. Then, on October 10, the health ministry suddenly made a U-turn. Instead of going to Delhi Police or taking action against MCI, it went back to Jethi’s plea of April 2014 and decided to transfer the anti-graft officer out of MCI. The decision had the personal approval of Vardhan. However, the CVC has stepped in. In an order sent on October 21, it has informed the health ministry again of the victimisation threats faced by Jethi. It has pointed out that more than a dozen investigation cases that Jethi was looking into are stuck with the MCI president, according to Jethi’s reports. It has asked the ministry’s vigilance wing to ensure Jethi gets the assistance denied to him and necessary protection through Delhi Police. Jethi being a full-time anti-graft officer at MCI, cannot be transferred without the approval of the CVC. Mehta did not comment on the actions of the CVC or the health ministry. However, she said she has all the documents to justify her statements against Jethi.